The right pump for every application. Depending on the quantity, the fuel type and technical compatibility requirements for the existing unit – we are happy to advise you. 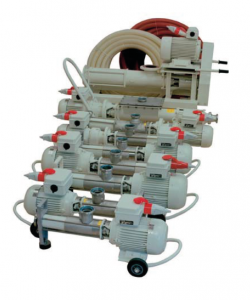 Self-priming eccentric screw pumps for conveying liquid or mash. Guaranteed gentle conveying of mash with solid content, such as cherries, plums, grapes and berries. We have suitable pumps for any application with conveying capacities between 4,500 and 40,000 l/h. Over the last 40 years, eccentric screw pumps have established themselves in the beverage industry as the most frequently used positive displacement pumps. The gentle handling of the product, the virtually pulsation-free, adjustable flow rate, their self-priming capacity and application options for conveying liquid, non-homogeneous and highly viscose products, are the reason for this pump type’s success. Choose our pumps featuring leading technology and outstanding processing! 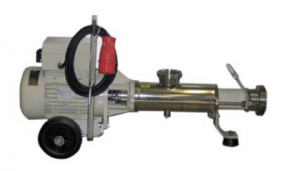 The SMH series includes pumps that have been specially designed for fruit distilleries. 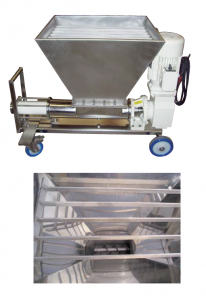 Due to the extremely large eccentricity of the rotor, the conveying chambers between the rotor and the stator have particularly large dimensions so that stone fruit mash can be handled with extreme care. All rotors are equipped for the installation of an intake auger with a threaded connection. The entry width of the pump can be equipped starting from type SMH 50 with a 90 mash thread so that a mashing funnel can be easily installed. 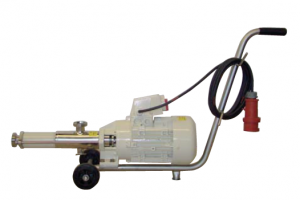 These mash pumps are ideal for distilleries. All media in the distillery are conveyed easily and gently. The cavities between the rotor and the stator, which retain their size, are “pushed” from the suction and pressure side during conveying. The conveyed goods are not squashed and no fruit stones are damaged by this. Medium: Liquid, pomaceous fruit and cherries with 2 rotation speeds 700 and 1,400 R/min. Medium: Liquid, pomaceous fruit, stone fruit (including plums) with 2 rotation speeds 700 and 1,400 R/min. 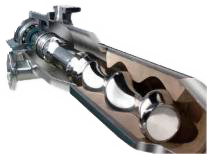 Pumps with large, rectangular funnel inlet opening and feeder screw. The SZH series is designed to easily convey products with a high level of solid content, mash, yeast and filter cake. This pump series can be used as a high density solids pumps with a mounted funnel, and as a liquid pump with closed funnel inlet opening and threaded connection. 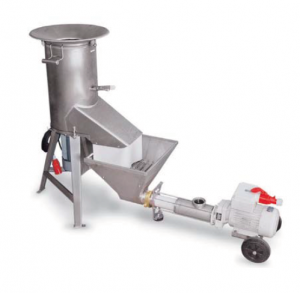 Makes the workload considerably lighter when mashing and pumping stone fruits or Jerusalem artichoke. Williams pears can be added without prior mashing.